First of all, I personally want to thank all of you who attended our three discussions from HeroesCon weekend. Oz with Skottie Young (thank you Heather! ), Batman: Black Mirror with Snyder and Francavilla (thank you Jason!) and Love and Rockets: New Stories with Jaime Hernandez (thank you Mr. Hernandez!). Now that we are all rested up, it is time to get back to our regular Discussion Group schedule! 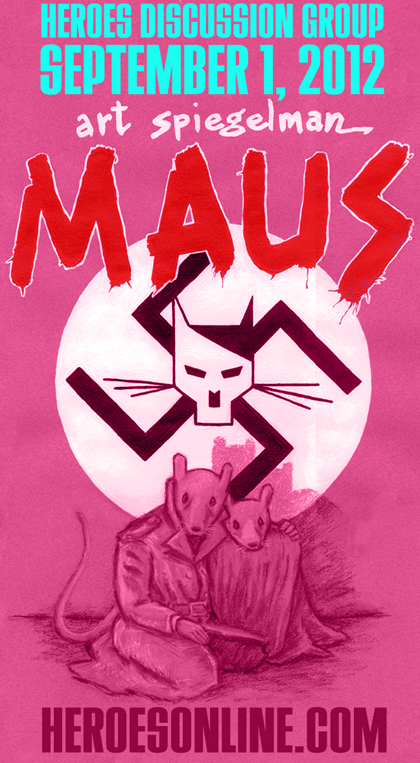 August: Discussion #48: Plan to join us on Saturday, September 1st as we tackle the graphic novel that is certainly one of the most critically acclaimed, vastly read and most often discussed: The Pulitzer Prize winning story of the Holocaust–Maus by Art Spiegelman.